This guide is going to explain how to recover deleted files from Windows computer via free solutions. You can follow this guide to get back deleted files quickly and easily. Windows operating system is the most widely used system on PCs and laptop. Operating system manages computer hardware and software resources and provides common services for computer programs. There are many versions of Windows OS already and it keeps updating and releasing new version till now. At present, popular versions are Windows XP, Vista, Windows 7, 2003, 2000, 2012, Windows 8 and 8.1. For computers, hard drive is used to store various data and files such as Microsoft Office documents, photos, emails, video, music, etc. As to computer users, deleting files from Windows computer can’t be more common. Most users want to delete unwanted or unimportance files to free up more disk space for new data. However, these operations can delete important files mistakenly together with those unnecessary files. Once important files are deleted, severe trouble or problem comes. People who delete files from computer can restore files easily from Recycle Bin. Whereas, sometimes deleted files can’t be restored in this way if they are deleted permanently or emptied from Recycle Bin. For example, if the deleted file is too large in size or deleted by “Shift + Delete” keys, then it won’t go to Recycle Bin. It is for sure that you can recover deleted files with the help of file recovery software. When a file gets deleted, only its reference pointer is deleted by system and the disk space turns unoccupied for new data. Content of the deleted file remains on hard drive until the disk space is taken (overwritten) by other files. Therefore, people is able to undelete files if the files recovery software is proficient enough to found out and locate the deleted file. 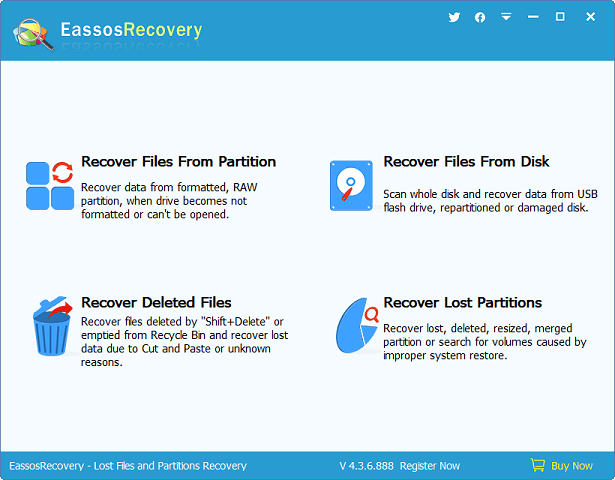 Eassos Recovery can a good helper to recover deleted files. It can easily undelete files from a variety of storage media, including hard drive, USB flash drive, pen drive, memory card, SSD, virtual disk, portable drive, etc. To get back lost data, it scans all sectors on hard drive with advanced file searching algorithm and then lists all recoverable files with original path and name. Thanks to its outstanding features and easy-to-use wizard, users are capable of restore lost files within a very short period of time. 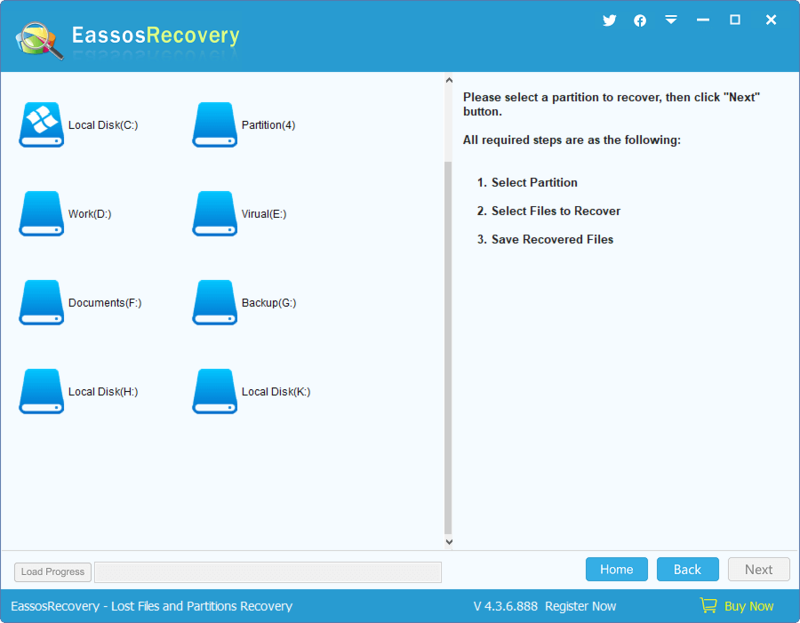 How to recover deleted files and folders from Windows computer with Eassos Recovery? Step 2. Click the icon of the partition where lost files were stored and click “Next” button. Then software start file scanning. This entry was posted in Data Recovery and tagged file recovery, file recovery software, recover deleted files, recover deleted files from recycle bin by EASSOS. Bookmark the permalink.